nice write up. i really enjoyed this film. surprised by how charming (and funny) it was. the music was fabulous. bridges would be deserving. Thanks for reminding me MrJeffery. I did fail to measure T-Bone Burnett's music, which was very charming. 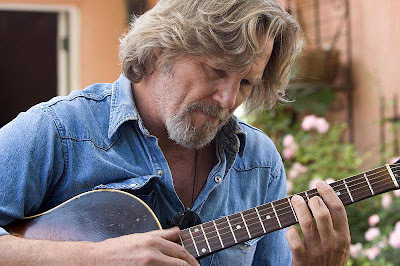 Tony, although I agree with you that Crazy Heart as a whole appears to be lacking in something, I think it's maybe also more complex and subtle than you are giving it credit for. It knows a lot about addiction without ever really being about it and the whole thing sort of embodies the sort of warn down but still suriving spirit of classic country music. My first impression of the film was that yes, the only reason to see it was because of Bridges and indeed, he is still the main one, but as I began writing my review, which will be posted on my blog in a day or two, I began to unearth a lot of small things that made me think maybe I needed to reconsider my position and that maybe it was better than I had originally thought. Mike, I didn't mean to come off as dismissive of the film as it seems. When I call it average, I simply mean it would be so were it not for Bridges' performance. I actually felt very comfortable drenching myself in the film's atmosphere. But nothing truly happens visually or storywise that elevates it above the level of just okay. And when the story turns on a contrived plot element at the climax, I really got mad that it stopped being a simple character study, an area where it seemed strongest. Whether you agree with me or not on the above, you have to admit it is too close to TENDER MERCIES to deserve any merit for originality, don't you think? I will indeed give you these two things: the Tender Mercies comparison is a just one and of the two that is the better film seems to end on kind of this perfect note and then of course "16 months later" flashes on the screen to cue the undeed epilogue. Some critics have compared this movie to The Wrestler which I think isn't a good one because the Wrestler was the kind of movie that was great despite Mickey Rourke and made all the better because of him. Of course that movie defined Randy the Ram as being a tragic figure, where Crazy Hearts never quite gives us enough information to know exactly how to feel. I felt sorry for Randy when the Wrestler was over and merely pondered whether Bad Blake deserves my sympathy after all at the end of Crazy Hearts. Maybe that's why I liked The Wrestler more.